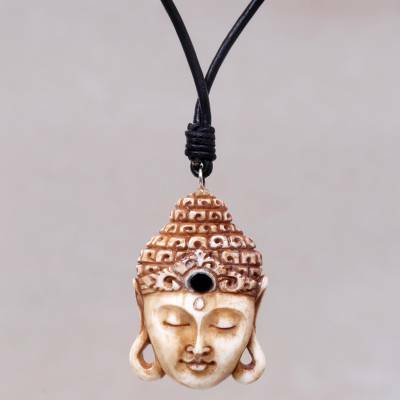 Buddha Pendant Necklace in Carved Bone with Leather Cords, "Buddha Head I"
This exquisitely detailed pendant necklace is from Made Wardika in Bali. The Buddha head pendant is carved by hand from cow bone and stained with tea to give it an aged, antique appearance. The artisan adds a bull horn urna, the "eye of wisdom", to the forehead. The pendant centers a dark brown leather cord of adjustable length. You can find bone pendant necklace 'Buddha Head I' by Made Wardika in jewelry categories such as Buddha Necklaces, Spiritual Necklaces, Buddhism Necklaces, No Stone Necklaces, Bone Necklaces, Horn Necklaces, Leather Necklaces, Cord Necklaces and Pendant Necklaces. Enjoy exploring these sections for other Novica treasures. This is a unique piece that was treated well for shipping. Harmonious!